Monsieur d’Nalgar’s note: The following reaction was set in motion by the arrival of a poem/article/essay by Ange Mlinko, entitled “Letter from Beirut.” It was published in the July/August 2010 issue of Poetry. 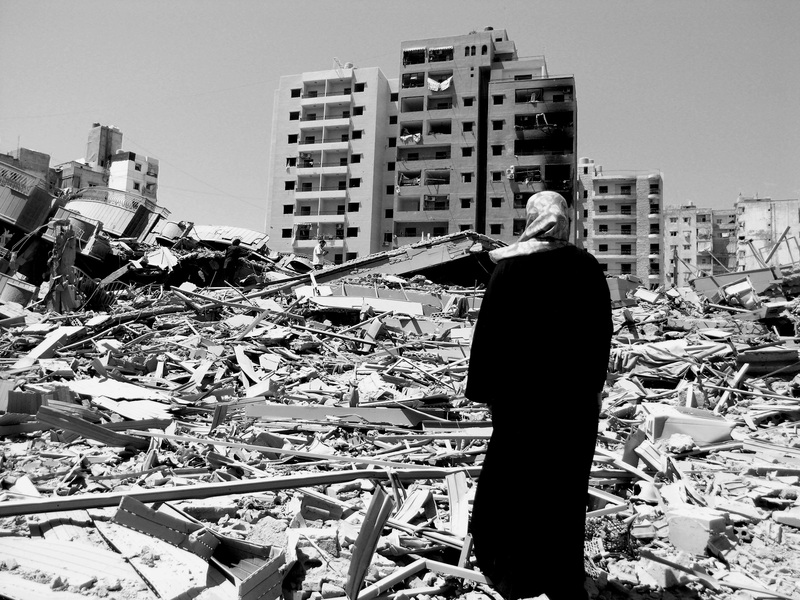 The photo below (©2006 Derek Henry Flood) is of a woman looking at the destruction of Haret Hreyk after the ceasefire was declared on August 15th, 2006. Hmmmm. This is not a koan: it’s an observation about authenticity, particularly in an Arab context. My apologies to Chris [name omitted] and Philip [name omitted] both for casting aspersions at a recognized artist’s take on our shared, our mutual heritance, the love that we have for Lubnan. But, howevermuch authenticity we might have for Ange(minus the L, please) Mlinko’s established credentials, as revealed in her prizewinning etc., we must admit that there are curious omissions from her Lebanese views: just to start with (this is the first of many such, so please read on, and don’t dismiss the conjecture out of hand), she has a curious inability to master nouns, particularly proper nouns. The place ‘in the Qadisha Valley’ is obviously our beloved Zahle … why can’t she remember that? Who knows where the Qadisha is? Does she remember it because it’s lacking the English ‘u’ after the Semitic ‘q’? Crikey. And when did bkhattrak become bihatrak? Whose transliteration is this? Does she even have any interest in the alphabet that she derives from the Phoenician, that includes both ours and …. (gulp!) theirs (=read, Arabic). And how many of us – really? – remember Rue Bliss (or even shara’a balis) as … Bliss Street? Is she attracted to the name because she relates to the emotion? Or does she relate to the name, and the history – and for God’s sake, the people, our ACS people –– as we do? … or should. Why doesn’t she name the school her children go to, or the university through which she drags her Cypriot oranges? If she were here for a week or what the Brits call a fortnight (in order to accomplish what I think must be her ‘travel poetry’), this might be understandable – this lack of perspicacity when it comes to places and their names, if she is actually living there — must be a kind of cultural blindness. Whyever would she raise the specter of her mother’s unfortunate spudding duties (does anyone actually ‘pick’ potatoes in any version of the universe, except maybe in bad translations?) in what must surely be the Soviet Union’s collective farms … waidaminnit. If she’s a Zionist, or an Israeli, or a Jew, she’d probably say ‘kibbutz’ at this stage … but, no, she says what she says … which is strange. In Russian, and probably in Ukrainian as well, there is ‘kollektivnoye khozyaystvo’ for ‘collective farm’ … but everyone who has ever lived on one or described it has referred to it as kolkhoz. Is she translating? Is she translating badly? Why don’t you people understand that (1) yes, any mention of our homeland is better than none at all, or (2) bad mention (comparison with Morroco, etc.) is probably not good – lending to our dismissal by the powers-that-be, by the ‘Poetry Magazine’ and people who support the notion that there are other people who know what they are doing better than we do (ie, poets)? Crikey. There is no such underclass. There are only the people who believe that Ange Mlinko is superior because she has (1) been there, and (2) done that. Ladies and gentlemen: I was in Vietnam. I (1) was there, and (2) did that … which in no way releases me from any obligation to observe ANYTHING beyond my original observation that Saigon was – with its mustards and its dark blues and its language – a colonial French city very much like the one I’d grown up in … Beirut. Ya haram, ya ferengi. Ya’ish lubnan.